One Hundred and four RS Dinghy Sailors enjoyed a great weekends Racing in Baltimore Sailing club this past weekend. 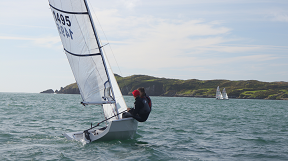 Blessed with stunning weather and perfect breeze for sailing all the crews arrived and departed West Cork with a simile on their faces………. Baltimore Sailing Club gave everyone a fantastic welcome and immediately the visitors started to feel very much at home and an important part of the BSC event. The weekend organisation was excellent from start to finish and the PRO Michael Tyrell did a great job setting some really nice races inside the protected waters of the harbour. The RCYC were heavily represented with Ten boats making the trip down. It was great to see so many smiling faces on and off the water and the wide age demographic across the classes. Young and old fighting it out on the water for the top spots and if they were not in reach battles further down the field developed between club mates and new friends alike. The RCYC Mixed Dinghies had great representation at the regatta and even brought home some Silverware (pottery) for their efforts. Fifty two boats in total took part over the weekend, eighteen RS 400’s, twenty one RS 200’s and thirteen Feva’s made for a very colorful display as they zig zagged their way down wind in the gusty conditions and stunning back drop. The occasional capsize kept the rescue crews on their toes but all things considered the sailors were all very self sufficient and the total lack of support RIBs you see at so many regatta’s these days made for a very pleasant change. Two handed racing brings out a very different dynamic in sailing and the RS fleet are doing a great job at bring crews of all ages to the start line in fast modern boats that are not crazy expensive. If you fancy some two handed sailing the RS Class has it covered for all……. A very special mention to Jim & Dee Griffith and team at the BSC for a wonderful weekend. I hope we haven’t missed anyone out! Very sorry in advance if we did! Sheila Lyden for organising a million things including a RIB for the video work, Paul and Tom Hegarty on the shore, PRO Michael Tyrell , and all the helpers, mark layers, RIB drivers, Ladies in the kitchen and Bar and all the Cadets organising trolleys, great work by everyone. Finally a big thank you to James Young for putting together this video of the weekend.